Big moves are coming in global macro, and USD is the starting catalyst. EM charts are saying a multi-year trend is developing. This bodes well for oil and if Brent closes above $80/bbl on a monthly basis, then technically speaking, it has a shot at $100+. Welcome to the global macro edition of Oil Markets Daily! There's nothing like the truth. Economists and market participants can make forecasts all they want, but at the end of the day, the only thing that really matters is what the prices (for assets) are telling us. It's with this perspective that we are seeing quite a big move brewing in global macro. If we take away the noise factors like the day-to-day or week-to-week movements, we can see a multi-year cycle developing. 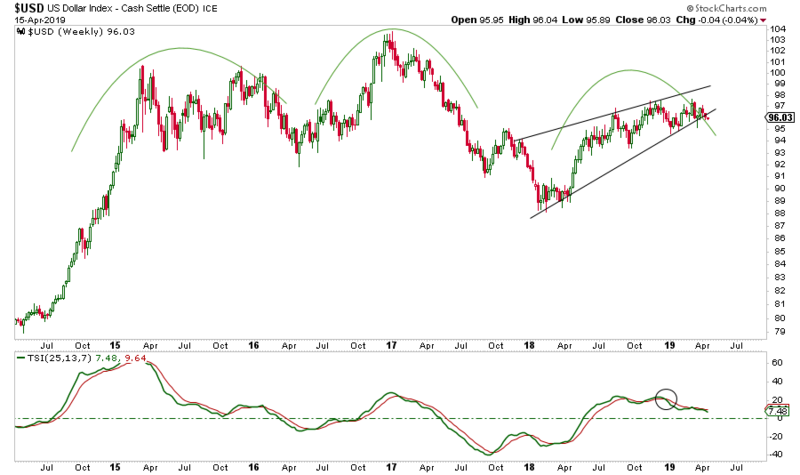 This cycle reinforces the thesis that oil is going to be in a multi-year uptrend and the worries over a major global economic recession may be completely overblown. Perhaps, this cycle lasts a lot longer than we expect as some are expecting US recessionary forces to start by the middle of 2020. Nonetheless, we will turn to the charts as our friend in guiding us through the uncertainty. The most important chart in the world today is probably the US Dollar. On a monthly basis, it appears to be forming a head-and-shoulder bearish technical pattern. On a short-term time horizon, the weekly chart is showing a breakdown in an ascending triangle pattern. 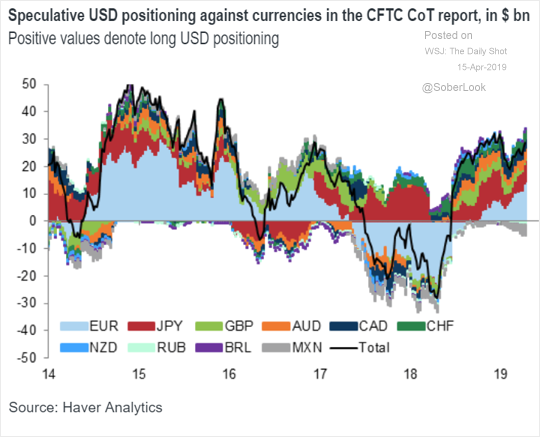 And on the positioning side, the long USD crowd has never been more concentrated since the sell-off in 2017. A weaker Dollar then also has cascading effects on the global economy, but especially emerging markets. For the oil market, EM is the engine for demand growth, so a strong growth rate bodes well for oil prices. For starters, the Shanghai Composite broke out of a massive downtrend last month. Considering that it tested the decade uptrend at the end of 2018 and held, we think it may be safe to say that the worst is over for now. This then brings us to the EM vs. SPY chart, which is very similar to the setup we saw in 2001-2002. Could we be just at the start of a multi-year uptrend in EM assets? We don't know for sure, but there's a bit of rhyme to this. And piggybacking off of the EM chart is the AUD, which is extremely sensitive to China's economic data. It has formed a nice bottom around 72 cents, and a breakout on a monthly basis would indicate that 80 cents might be back in play. For the EURO, we are seeing a similar crazy set-up. The monthly chart shows a massive bullish descending triangle setting up with a monthly break above 1.15 confirming the near-term pattern breakout. This would push EURO too retest the 1.2 level on a monthly basis for a decade downtrend breakout attempt. If it does, then the USD decline is multi-year in length as well. Finally, if USD does decline and emerging market growth does hold up, then Brent will likely retest the $80 level, which is the decade downtrend line. And, if our analysis is right, and if Brent breaks that downtrend, at least on a technical level, $100 Brent is not out of the question. So, from the charts, we are seeing rather big setups coming for the global macro markets. Similar to April last year, the trigger will be the next move in USD. A weak Dollar will have an immense impact on EM and, as a result, oil. We will be watching the macro moves closely in the coming months. P.S. Let's not forget about copper either. Disclosure: I am/we are long UWT. I wrote this article myself, and it expresses my own opinions. I am not receiving compensation for it (other than from Seeking Alpha). I have no business relationship with any company whose stock is mentioned in this article.